UK residential property market 2014: onwards and upwards? The short answer is….? Almost certainly, yes. Not so much a question of “when” but “how high”? The latest data from the Nationwide monthly survey shows a drop in the rate of increase in prices but they are still going up and the UK average is now £174k. Overall they are now 8.8% higher than a year ago and less than 6% from their peak in 2007. Graph reproduced with the permission of The Nationwide Building Society. © 2014 The Nationwide Building Society. All rights reserved. 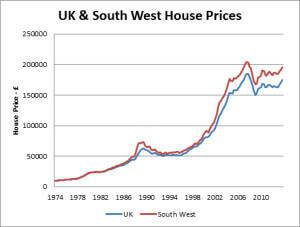 It is interesting to compare the price of South West (SW) houses against the UK as a whole. In 1973, when Nationwide started its index, the average price in the SW was just under £10k – bang on the UK average. Forty years later and you need to find £195k for the same house and we are now 12% higher than the UK average. Of course this change reflects the popularity of the SW as a retirement and second home location with all that that entails if you are a local resident. Not surprisingly, volumes are up too. The Land Registry records completed sales – not always immediately though if you don’t use the right solicitor! Over the 3rd quarter of last year they recorded about 23% more transactions than the same period in 2012. As a consequence of the above some commentators, they tend to be the ones in the more sensational press, are immediately talking about the possibility of a house price bubble. The Government and the Lenders would say no. The Lenders argue they have already tightened their lending criteria. However, just to make sure, the Government has introduced new rules that come into effect in April and many Lenders are already implementing them. These rules increase the amount of checking that a Lender must do to validate the “affordability” of the mortgage. This will almost certainly reduce the amount borrowers are able to borrow and the Lenders say it will draw out the process of lending. Both factors are significant and will reduce the likelihood of the “bubble” bursting. So, “how high”? The key question is whether the considerable pent-up demand will outweigh the constraints on lending. It is likely that the rate of increase in prices will stay reasonably high for the next couple of months, possibly even with a flurry before the new lending rules bite completely. Late Spring / early Summer could well see a fall in demand immediately post their introduction and plateau through July / August and so the biggest imponderable is whether it will pick up again in the Autumn the way it did in 2013. I am no gambler but if I were, my money would be on a quieter Autumn than the one just past but we will see.